The lake is very still today. Usually the lake, Lake Michigan, behaves more like an ocean than a lake. The breakers roll onto the beach. It is famously fickle and can change moods in a heartbeat. It regularly swallows tankers. This winter it swallowed more than a little bit of the shore. The Coast Guard routinely practices search and rescue missions off the coast; we’ve stood on the rocks many evenings and watched the helicopter go through its paces. Today there is calm. Today there is peace. This afternoon I completed the 65th and final illustration in the Shayne Trilogy. Like the lake, when I cleaned my brush and put it aside, I was quiet inside. In the middle of March, after a call with Beaky, we decided there was nothing more important than illustrating and publishing the manuscripts that she’d written. And, there was no time to waste. We illustrated, designed, and published the first book of the series in record time. Beaky had her very first-ever book reading and author signing on April 11th. It was a triumph. That day I knew I that I would never do anything more meaningful or important in my life. When Beaky passed away at the end of April, the second book was midway through the design phase. 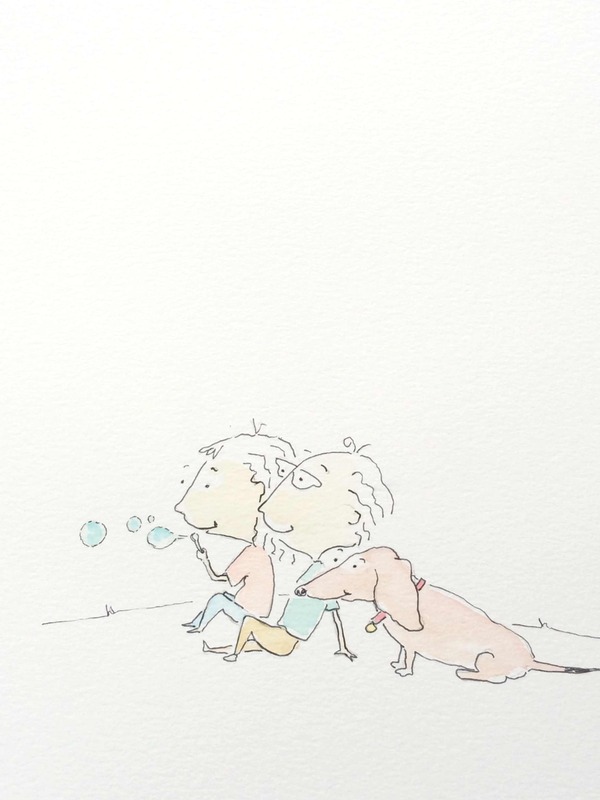 The illustrations were complete and Kerri was working furiously to publish it by May 1st. Beaky’s passing, of course, derailed all progress and I wondered if we would be capable of bringing all of her books to the finish. We were still for many weeks. We were breathless. And then, last week, out of nowhere, a strong wind caught our sail and we were back at it with the same fervor as before. It was as if someone threw a switch; we did not get out of bed that day intending to resume the work, but by noon I was drawing the next batch of illustrations and Kerri was layering words over images. The second book, Shayne And The Yellow Dragon is, at this moment, a single click away from publication. Yesterday Kerri began laying out the final book in the trilogy, Shayne And The New Baby. At this pace, we are a few short weeks away from finishing what we started a lifetime ago in March. The illustrations are simple. They came easily – as do all labors of love. They are just what Beaky wanted. “You two did all the work!” Beaky protested as we wheeled her toward the over 70 people that gathered for her reading. I teased her that she must have forgotten that she wrote the books. “We make a good team, Beaky,” I said, and she smiled. “The most important thing in life is to learn how to give out love, and to let it come in.” Mitch Albom, Tuesdays With Morrie. Somewhere in the 22nd hour of our drive, the sun rose. Even through our exhaustion and bad fast food coffee, it took our breath away. It replaced, or, rather, swallowed, a brilliant sliver-crescent moon. We’d stayed longer in Tampa than we expected. The day after Beaky’s book reading and signing, Sunday, we were exhausted so we delayed our return trip home for a day. The following day, Monday, was bad for Beaky – she was in tremendous pain and we were overwhelmed with the need to stay. So, we stayed, knowing the result would be a 24 hour dash home for rehearsals. …and the truth of beakybeaky…. This year is unusual. I’ve done too many plays, paintings, and projects to count and each had its rewards and regrets. Twice since the turning of the New Year I’ve completed a project that was so fulfilling, so right, that I would not change a thing. Both have this in common: the intention was pure. I did them for the right reason: someone else. The first, The Lost Boy, was a message from Tom to his nephew, Seth, and I was the messenger. The second, Beaky’s first book, Shayne, was to make a dream happen. Every dream needs assistance to be born: the manuscripts existed. Beaky’s desire to share (publish) existed. They lacked an illustrator and designer. I did the illustration. Kerri did the layout and design; a dream fulfilled itself. For me, both are lessons in breathing out love so that I might also breathe it in. 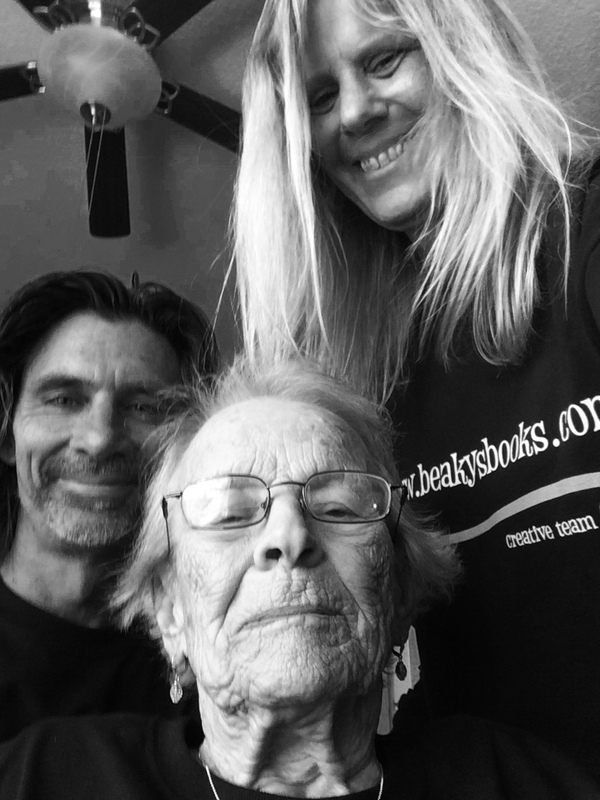 Just prior to Beaky’s reading, we took a series of selfies with her. I told her that, if Beakybeaky was a rock band, the selfies would make excellent album covers. 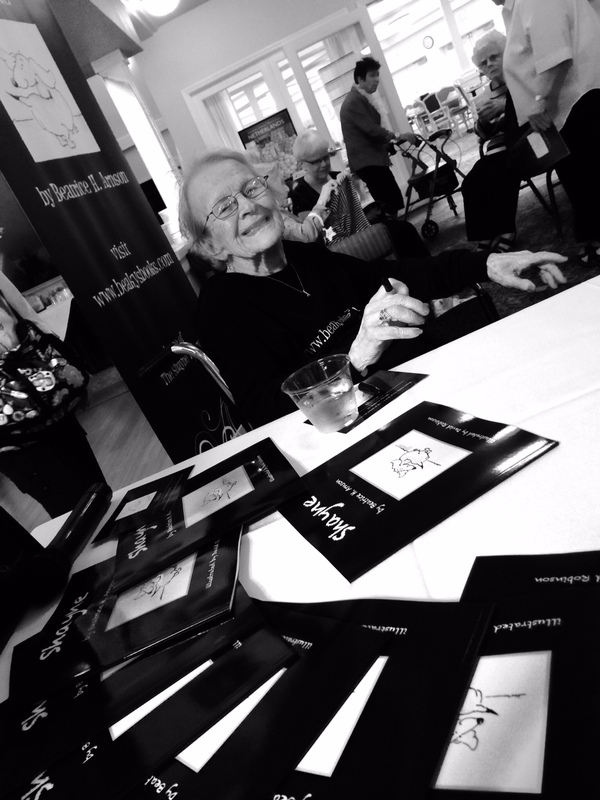 After our photo opp, we wheeled her to a standing-room-only crowd, many people that she knew and many more that she didn’t, people who’d gathered to hear an almost-94 year old author read and sign her very first book. Breathe out. Breathe in. It turns out that an exhale is necessary for the inhale. About six weeks ago, Beaky called to discuss her writing and the viability of sharing it. 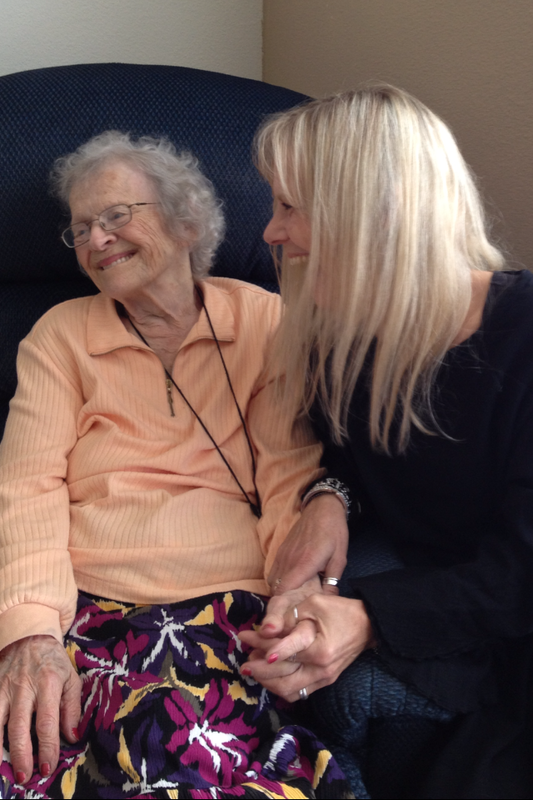 Beaky is a few months shy of 94 years old and puts pen-to-paper almost every day. She calls it chicken scratch and is mostly unaware that she is a fantastic storyteller (actually, I believe she knows it but is too humble to apply the word ‘fantastic’ to herself). She can’t help it; storytelling is in her bones. Some of my favorite days of the past few years have been at Beaky’s side listening to her tell a tale. 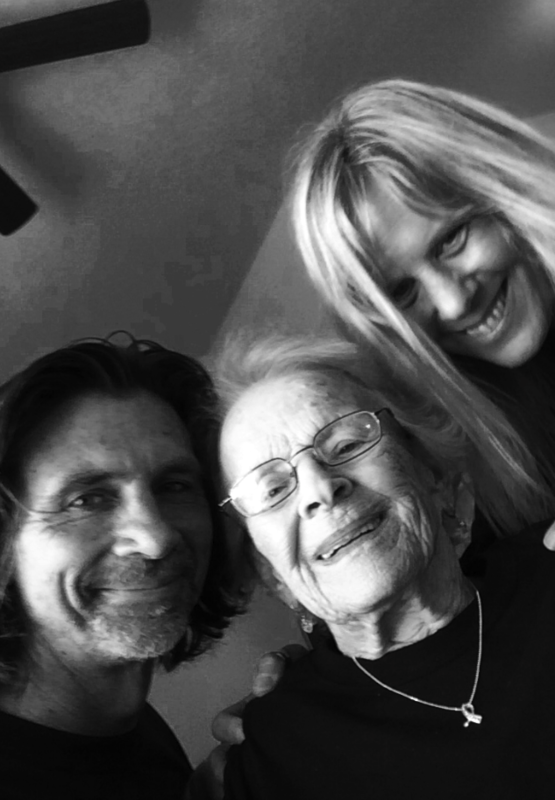 At 93 she is reviewing her life and, like all of us, she wants to do more, be more. It is hard to understand for those of us who know her because she is a rare and special person. She is a bringer of joy; Beaky makes people smile. That, too, is in her bones. Some months ago we spent a long night in the emergency room with her. She’d taken a fall and we feared she’d broken her hip. Deep in the night, writhing in excruciating pain, Beaky looked into the eyes of an exhausted attending nurse and through her pain said, “You have the most beautiful smile.” The nurse giggled, blushed and beamed. Laughter, blushing and beaming are common occurrences when hanging out with Beaky. Even while in pain she seeks the giving-moment. 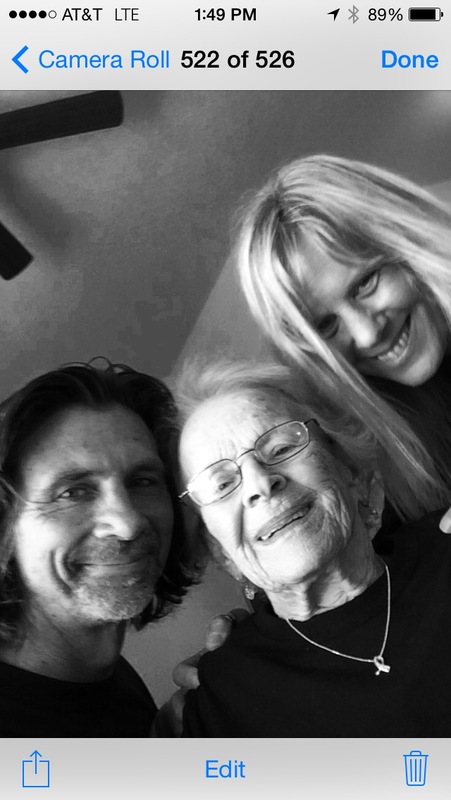 Almost sixty years ago she wrote a trilogy of stories for her children. For months we looked high and low for the folder of her stories. Not long ago we found them and discovered that each had a submission cover page; Beaky wanted to be published. So, we decided to put our heads down and make it happen. I illustrated the first book and Kerri did the layout and design. 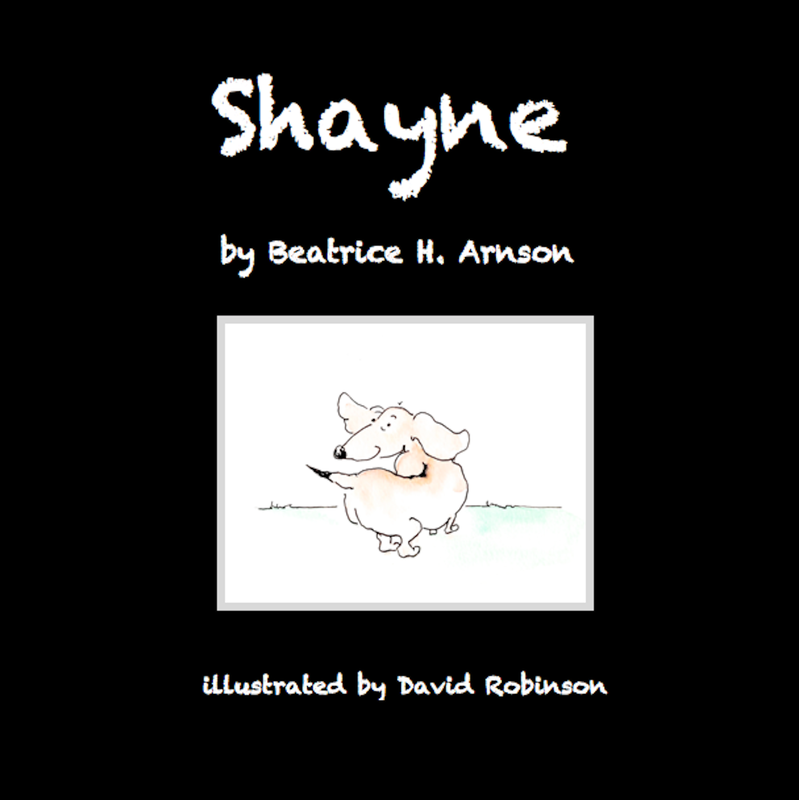 Today, Beaky’s first book, SHAYNE, is now available; it is published. Beaky is published. Within the next two months the second and third books of the trilogy will be published, too (SHAYNE AND THE YELLOW DRAGON and SHAYNE AND THE NEW BABY). Next week we will travel to be with her as she has her very first book reading & signing party. She is, of course, busy practicing her signature (wouldn’t you?). Jim has a magnet on his refrigerator that reads, “It is never too late to become what you might have been.” In Beaky’s case I might add: It’s never to late to realize what you have always been AND be a children’s book author, too.